The USS Zumwalt will still be launched on schedule from Bath Iron Works on Oct. 19. WASHINGTON — The federal government shutdown has prompted the Navy to postpone the christening of a destroyer planned for this month at Bath Iron Works. The Navy planned to christen the USS Zumwalt – a first-of-its-kind DDG 1000 destroyer – at a ceremony in Bath on Oct. 19. But the Navy announced Friday that the christening has been postponed because much of the federal government remains shut down during the budget stalemate in Washington. The vessel is expected to be launched on schedule without a public ceremony. BIW spokesman Jim DeMartini said that, despite the postponement of the christening, the USS Zumwalt will still be placed into the water at the shipyard’s docks so that crews can test equipment – including the ship’s massive engines – and finish building the destroyer. 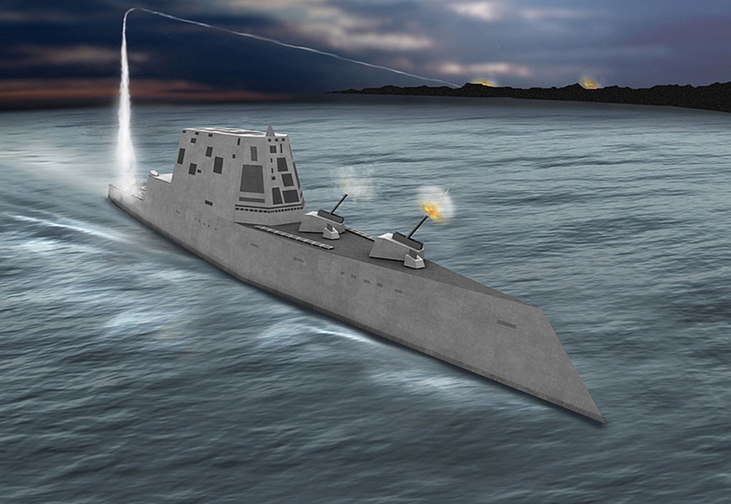 The Zumwalt is roughly 85 percent complete and is due for delivery to the Navy in 2015, DeMartini said. “We are continuing with the ship construction schedule, as planned,” he said. The Zumwalt is the first of three DDG 1000s under construction at BIW, although the vessels’ deckhouses are built at a competing shipyard in Mississippi. Designed to be a “stealth destroyer,” the DDG 1000 was touted as an ultra-high tech ship capable of operating close to shore. But the Navy canceled the program – deciding to build just three ships instead of the originally planned 32 – in 2008 after concerns were raised about rising costs and aspects of the design, such as its defensive capabilities. Instead, the Navy switched back to focus on the well-trusted DDG-51 Arleigh Burke-class destroyers, which are also built in Bath. The new ship is named for the late Adm. Elmo R. “Bud” Zumwalt Jr., a former chief of naval operations. The Navy said it is coordinating with BIW and the Zumwalt family to reschedule the ceremony. U.S. Rep. Chellie Pingree of Maine said the postponement is a disappointment, especially for the workers who have been building the ship for several years. A subsidiary of General Dynamics, BIW is one of Maine’s largest private employers, with more than 5,000 workers. “The christening of the Zumwalt is a big deal, but the government shutdown just made it impossible for the Navy to pull off the ceremony next weekend,” Pingree said. DeMartini said BIW had been planning to seat as many as 4,000 people at next week’s christening ceremony. “This is the lead ship of its class and a family that is well known in the Navy community,” he said.